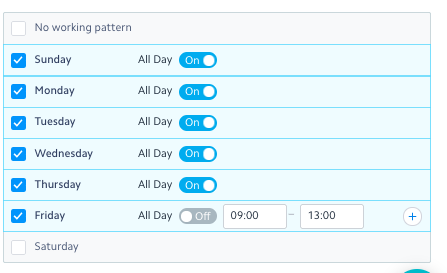 The Weekly Working Patterns is a manager tool that allows you to set the recurring availability pattern for a person's working week. To access weekly working pattern for a person open their profile up on the People Page and navigate to the Scheduling tab. You should see the Weekly Working Pattern at the bottom of the sidebar. By default there is no working pattern set for a person; this means they are available to work at any point in the week. To set a working pattern for a person you can use the tickboxes to select which days they are available to work. 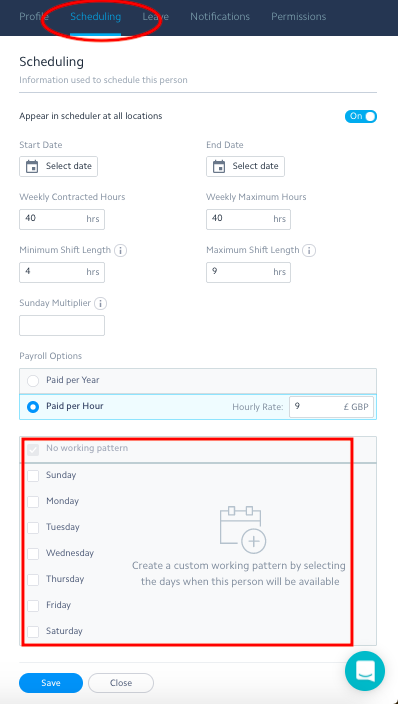 You can also specify the hours they are available to work that day if applicable by turning the 'All Day' toggle off and amending the start & end times. This person is available to work all day from Sunday-Thursday, only available between 09:00-13:00 on Friday and unavailable to work on Saturday. The Weekly Working Pattern for a person is then displayed on the scheduler each week to help you build a better rota. Whole days which are unavailable will appear in red, while availability for parts of the day will appear in green. If you use Autoscheduling the rota that is generated will be built around your staff's weekly working pattern as well.